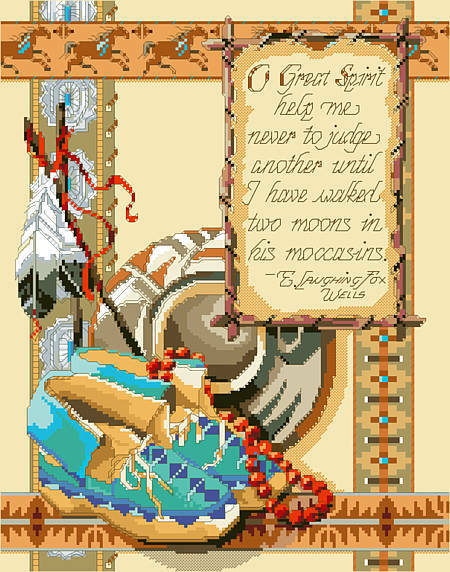 "O Great Spirit, help me never to judge another until I have walked two moons in his moccasins," words of E. Laughing Fox Wells. 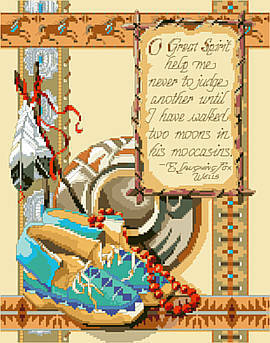 From the legends of Navajo history and lore comes this Counted Cross-Stitch design rich in verse, symbols, and motif in the warm reds, turquoise blues, and desert sand colors of the Southwest. Contents: Stitch Count 154w X 196h. Finished size on 14-count 11" X 14"